In all the fuss over the events at Spa last weekend, Grand Prix dot com ran a little story that went largely unnoticed but is crucial to the future of F1. The Formula One Group has submitted a proposal for the continued use of customer cars beyond the end of 2009, apparently in an attempt to ensure the survival of Scuderia Toro Rosso. Toro Rosso desperately need something of the kind, with Dietrich Mateschitz intending to sell off his share in the team by 2010 and yet a sale being virtually impossible as long as STR are faced with the costly prospect of having to become constructors in a very short time. The sport is also facing a time of dwindling numbers of teams as it becomes clear that only very large companies can afford the enormous expense of starting a new team from scratch. Rumors of possible entry by such companies as Volkswagen/Audi surface occasionally, only to be promptly squashed by the company itself. If STR disappear after next year, the last independent teams will be Williams and Force India and the F1 grid will have shrunk to a mere 18 cars. Although the FIA is desperately trying to halt and reverse the constant increase in costs that threatens the survival of small teams, their attempts so far have met with little success. Unless the much-vaunted exercise of cost-capping proves effective beyond expectations, the days of the small constructor look numbered. Naturally, we all want Williams to survive and prosper, their history over the last thirty years having been so studded with glorious episodes. But other great teams have faltered and failed, some (Lotus and Brabham) having been even more illustrious. The real world is a tough master and no respecter of past achievements. Previously, it has been the refusal of Williams and Force India to hear of the legalization of customer cars that has scuppered attempts at compromise. Times change, however, and it may be that they will be more amenable to an agreement this time. Last year Sir Frank Williams was talking from a position of strength, his team having used its Toyota engines to greater effect than the manufacturer's team; this year Toyota have improved steadily throughout the season to be in contention for points at every GP, whereas Williams have fallen behind. Teams at the back of the grid find it more difficult to find sponsorship and so enter the downward spiral of smaller budgets, slower development and correspondingly less success. It is a process that we have seen devour great names again and again in the past. If the small constructors are to avoid the trap, it may well be that they, too, will have to consider the customer car option. The reason for Frank Williams' objection to customer cars is being ably demonstrated by STR at the moment. The Red Bull second squad is not only embarrassing its sister team, presumably thanks to its more powerful engines and talented drivers, but it is also well ahead of Williams. As Sir Frank says, why should a team that buys in its chassis be awarded constructors championship points when it is quite clear that it has constructed nothing? That is the main sticking point in the argument. Various compromises have been suggested but nothing has succeeded in adequately compensating the small constructors for having to compete with teams that can run on less money through buying in a chassis. Hopefully, the latest attempt at compromise will address this issue and provide a way for all the teams to remain in F1. 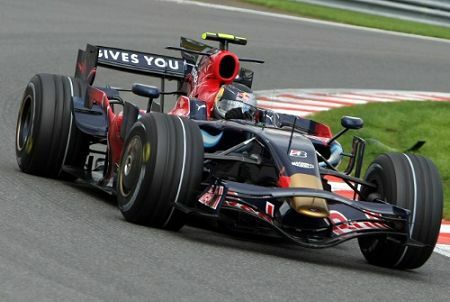 For the sake of the sport as well as STR, the problem of customer cars needs to be solved as soon as possible. If the latest suggestion is not acceptable, the teams must continue to seek a solution that will satisfy everyone. Clive: If indeed customer cars are made legal in some form or another, where does put ProDrive? Do they still have some sort of approval? What ever happened to the large sum of money they initially put up? As far as I know, Don, Prodrive are now doing other things and would be extremely unlikely to want another go at entering F1. Their approval would have to be re-applied for, at least. Perhaps it would lead to a rebirth of independent chassis builders. Certainly true, Alianora, but they are in the weakest position of all, with the smallest budget and a many years of big spending ahead of them before they can be considered established in F1. It may be quite tempting for them to shortcut the process by buying in a chassis too. At least if the option is there, they can take that route if it becomes apparent that the cost of remaining a small constructor is beyond Vijay Mallya's finances. That's the thing really - the small teams need to be thinking several years ahead, rather than about this year or the next. It may be against Force India's interests to have customer cars allowed next year but thereafter it could well be to their advantage if they are legalised. I think it would take a lot more than allowing customer cars to bring about the rebirth of the independent chassis builder, Don. That could only happen if the formula were changed drastically to bring costs down to a fraction of what they are now. And that would mean abandoning the present direction of high tech materials and methods of construction. It would require a considerable shift in the ideals of a sport that bills itself as the pinnacle of engineering innovation and excellence. It might sound too easy, but why not do away with constructor points? No one cares who wins the constructors anyway - its all about the WDC. Then surely, there would be nothing to quibble about? And it would completely remove this constructor vs. customer car debate. Or maybe rename it team points or something with no emphasis on how the car was built. I think the team owners would never go for it, Peril. Most, if not all of them, consider the constructors' prize more important than the drivers', even though they know the public only notice who become WDC. It's why the manufacturers are there, of course - to prove that their Flubmobile cars are the best, not that Jimmy Dumpling is the best driver. To them, the driver is just a component that you buy the best quality that you can find and fit it into the hole in the middle, just in front of the engine. I have serious doubts that there is any way to cut F1 budgets. Teams that have access to money will find ways of using any money they have and I doubt if Max and / or Bernie can do anything about it. If teams are willing to spy, cheat and tempt away personnel from other teams, how could they possibly be made accountable for all the R+D that the mother companies such as Mercedes, Renault, BMW, and Ferrari can spend on things that may be justified for other racing series or "dreamcars?" The claim "by Bernie and Max" is hypocrisy! The reasoning is that if the cost of teams is less, the teams will not have as much justification for asking for as high a percentage of the take, so more goes into Max & Bernie's coffers. Anyone who thinks the price of admission to a race will drop two cents despite halving the costs will most likely be in for a surprise. It seems to me Paul Stoddard said he might give F1 another shot after Mosley's gone. Clive; You certainly summed up Frank Williams attitude towards drivers. Except for Alan Jones, I'm not sure any of Frank's drivers returned to the team after winning the WDC. He just wouldn't pay the extra they thought they should get for being a WDC. If Rosberg leaves Williams it will surely be because Frank thinks he's asking for more than a driver is worth. Nick: I agree that cost-capping is unlikely to succeed in its aim and is more likely to increase the advantage of manufacturer teams since they can hide costs more easily than small teams. But I am prepared to see how it goes - let the results prove just how wrong Max is. Lonny: To be fair to Sir Frank, he is the one who has to find the money to pay the drivers and every dollar he gives them is a dollar less for the research and development side. It's a balance between the two expenses and Williams have their way of finding it, just as others have theirs. Any number of ex-drivers or owners would be a massive improvement. I suppose we should be happy that Mosley isn't head of a country with an army or nuclear weapons. It makes one wonder if fascism is genetic, doesn't it? Lonney: Villeneuve returned to Williams after his championship only to be given a substandard car. Lonny, sorry for the extra "e" in Lonny. Nick: I've been called worse. I have always felt JV contributed to the substandard car by being a substandard development driver. He's good in a race with a proven car, but I don't think he ever turned any raw design into a winner. Clive - I think you're right about Paul Stoddart for FIA President. Talk about throwing a spanner! Alianora and Clive - I don't think Force India have justified themselves as an outright Constructor yet. Aren't they still using effectively a B or C-Spec of the Spyker/Arrows? Doesn't seem like they have a lot of credibility for this argument to me. Williams of course have their own credibility problems in this argument (according to some), but having won 9 Constructor's Championships since Frank's customer days, surely they have more knowledge than any other current team in this department, having been on both sides of the fence.